I had flipped through the pages of this book several times, but hadn't bought it. Then a few weeks ago, I saw it again and it was mine! Worth every penny! I've read it cover to cover and admire how much information is contained between these covers. Just the info on saving your bits and pieces of scraps--and then actually using them--is cause for celebration. So give this book a look-see. There's something for everyone! P.P.S. I have updated my class schedule here. Maybe I'll see you at a class this fall! While perusing the All People Quilt website, I found a great pattern for a table runner. You can find it here. You needed eighteen 2.5 inch strips. I was lucky to find a half-jelly roll (20 strips) from Lunn Studios and off I went. With lots of fabric left, I figured I should be able to get another runner--and I was right! I am not as fond of this one as the first one, mostly because I had to cut the proper length strips from what was left, not necessarily for how I wanted each block to look, as I had in the first one. And then, what do you do with what's still left of the strips? Mug rugs, of course! 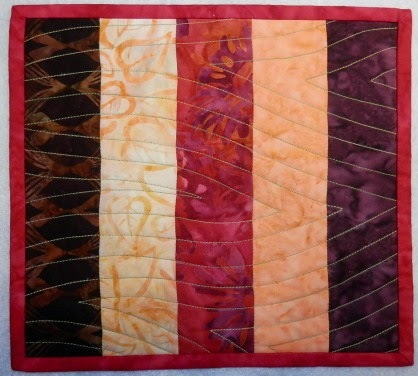 I stripped five pieces together and machine quilted them with a flame-like design. One of the rejected strips was used as the binding! 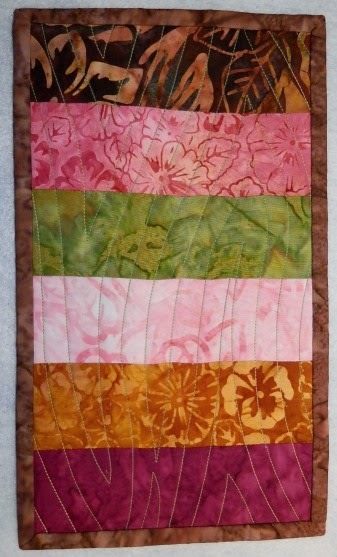 Still a bit left, so I pieced six of them together for another mug rug, again using a rejected strip as the binding. As you can see from each of these, the quilting distorted the straightness of the seams. 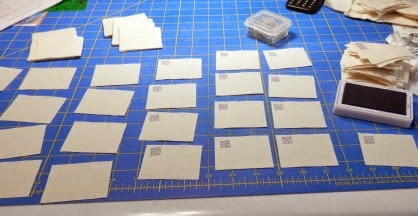 The pieces are square/rectangular because I trimmed them after quilting and before binding. 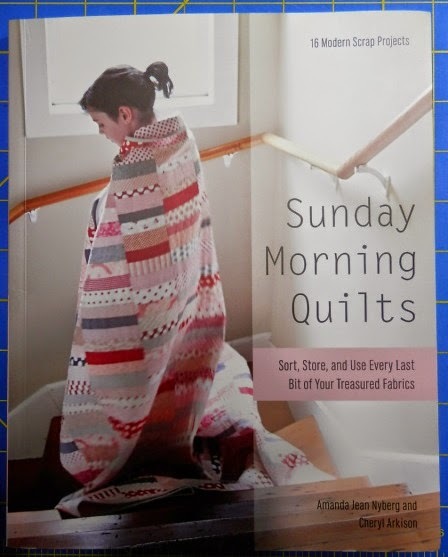 I am a hand quilter, but you know what? I am so thrilled with making mug rugs that I am using them as a chance for creativity and joyful abandon! Will I try to do better on the next ones? You bet. But not at the expense of enjoying the process. And I got pretty darn close to achieving my goal--nothing of the 2.5 inch strips left. Most are pieces under 2 inches and the longest one is 17 inches. I think I did pretty good--especially when I started out to make one runner! Enjoy the start to the work week! P.S. I am listening to The King's Deception by Steve Berry. 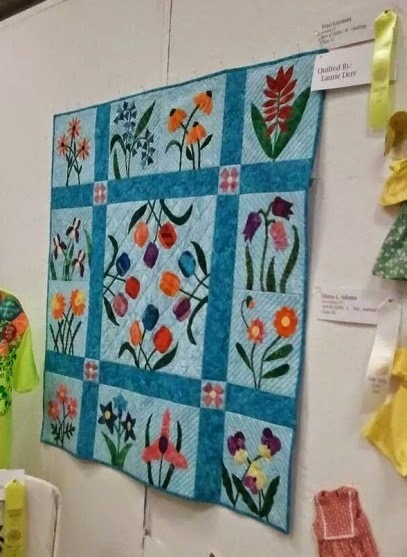 Traci L. won an honorable mention for her Flower Garden quilt at the New York State Fair this summer!!!!! Using my patterns, Traci hand appliqued all the blocks, and our friend, Laurie, did the machine quilting. It is just stunning! Bet that title had you doing a double-take! But here it is--the purple thumb of productivity--in living color! And what, you ask, made my thumb so purple? 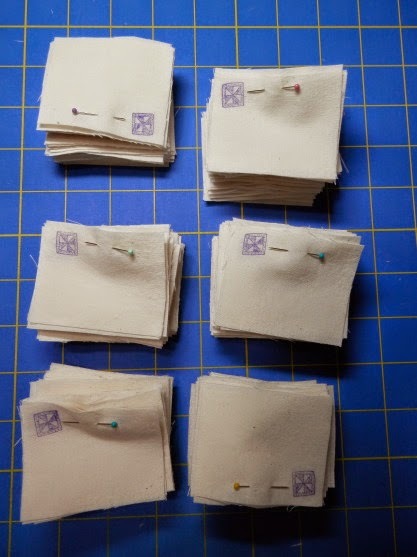 Why making hundreds of muslin nametags! 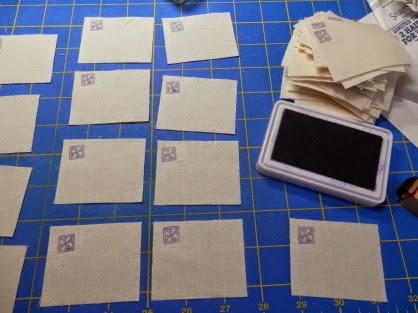 Cut from muslin and then stamped. And neatly stacked, with pins in place. Ready for a student's name and the fun to begin. I think there are close to 300 stacked here. Ready for the start of a new school year. Even though I teach quilting year-round, I still divide the time into semesters, just like college. It's September already and I have a new tote bag to cart all my stuff (yes, still a giant LL Bean Boat & Tote!) and I've sorted and eliminated and re-organized it. And tried to make it a bit lighter! Not sure how well that part worked! 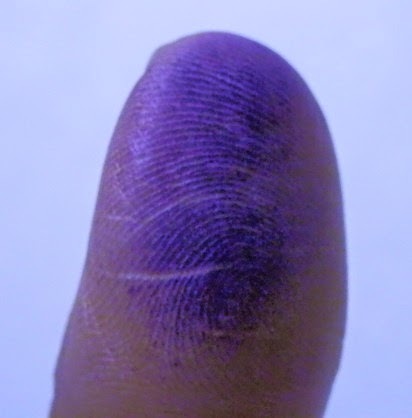 Did you have a purple thumb of productivity today? P.S. I am listening to Whiskey Beach by Nora Roberts. And I'm giving a WOW to Keep Quiet by Lisa Scottoline--never saw that coming! September 1. 2014 is sure flying by. For tonight's viewing enjoyment, I give you fungus! 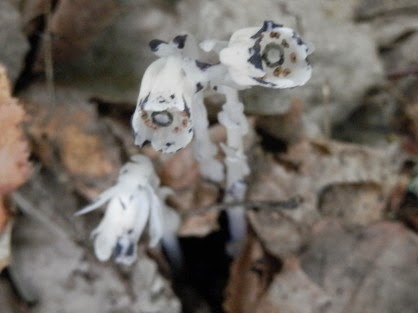 These were in the woods in the Adirondacks. Very tiny. 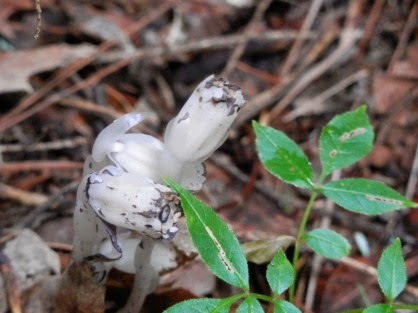 You almost miss them among the leaves and other debris on the forest floor. I've been busy sewing and doing the dreaded paperwork. I finished appliqueing and adding borders to a small applique project and machine pieced two table runners. Ideas are churning in my alleged brain for some new class projects. I'll share the table runner pics soon. For teachers and parents: The wait is almost over! For some (parents) that's a good thing! For teachers? Probably a mixed bag! P.S. I am listening to Keep Quiet by Lisa Scottoline; very suspenseful, hard to stop listening!